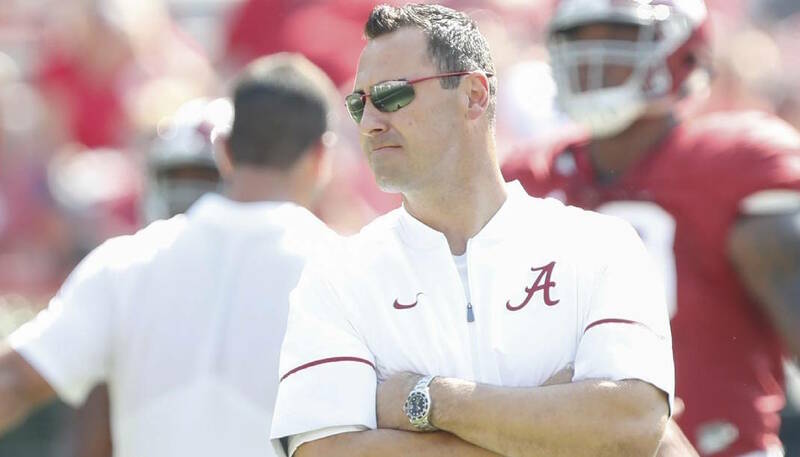 Steve Sarkisian is back for a second stint as Alabama's offensive coordinator after serving in that role for the final days of the 2016 season. That was quite a process. Alabama football coach Nick Saban finally announced his 2019 staff, which will include seven new faces. The new hires had been reported by the Times Free Press and other media outlets but had not been confirmed by the university until Friday afternoon. The offensive staff will consist of Steve Sarkisian (coordinator/quarterbacks), Charles Huff (running backs), Jeff Banks (tight ends/special teams), Kyle Flood (offensive line) and Holmon Wiggins (receivers). Banks is Alabama's only returning assistant who has the same responsibilities from a year ago. The defensive staff includes Pete Golding (coordinator/inside linebackers), Brian Baker (defensive line), Sal Sunseri (outside linebackers), Charles Kelly (safeties) and Karl Scott (cornerbacks). Golding was promoted to coordinator to replace Tosh Lupoi, who last month became the defensive line coach of the NFL's Cleveland Browns. Scott handled the entire secondary last season for the Crimson Tide and joins Banks and Golding as the lone returnees. "We are excited to be able to assemble such a talented group of coaches to develop our players both on and off the field," Saban said in a release. "These coaches have a great mix of energy, enthusiasm and experience that will be a tremendous asset to our program. Alabama did not reveal a role for former Tennessee head coach Butch Jones, who worked last season as an offensive analyst. It has been reported that he could be the senior analyst for the Crimson Tide this year.